Paul Smith, who readers may recognise as the creator of the "Prisonbear" films has two new films online, both featuring Portmeirion. 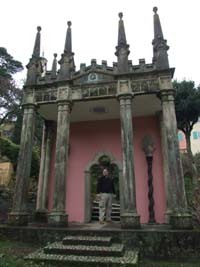 The first is a 13-minute guided tour of the "Prisoner" locations at the resort, very loosely inspired by Catherine Frumerman's "On the Trail" guide book, on sale in Portmeirion. Accompanied by a whimsical yet accurate commentary, Paul takes us through the main filming locations and the episodes featured by them. Also online is a second film, which shows a complete day in Portmeirion, from morning until night, speeded up into 13 seconds of fast footage. Thanks to Paul Smith for this news item, links, and image.